An engineering team at NASA’s Glenn Research Center (GRC) in Cleveland, Ohio, is designing one of the most unusual vehicles in NASA’s history – a submarine. No, NASA has not taken over for the Navy. This is not just any submarine. 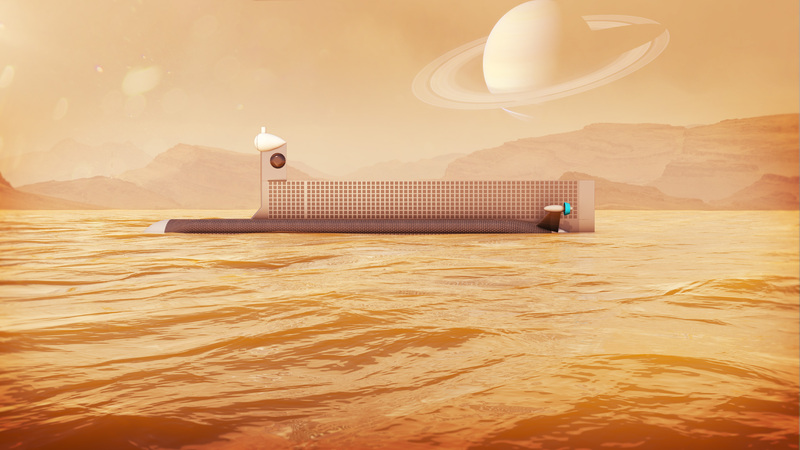 This submarine is designed to explore an environment never-before-seen by humans – the liquid hydrocarbon lakes and seas of Saturn’s largest moon, Titan. “The early explorers explored the seas on ships here on Earth,” said Steve Oleson, leader of the NASA Glenn team designing the sub. “But I think they missed a lot of stuff. So, for Titan’s seas, I said why not a submarine?” Oleson proposed the concept of the Titan Sub to NASA’s Innovative Advanced Concepts (NIAC) program and was awarded funding to develop the design. The current mission outline has the sub arriving at Titan sometime in the 2040s when the northern region of Titan goes into its summer phase. The sub would splashdown aboard a USAF X-37 spaceplane, which would then sink and release the sub into the sea. The approximately 1-tonne (2,200 lb) sub is an autonomous submersible vehicle, powered by two Stirling radioisotope generators that utilize the heat produced from the natural radioactive decay of plutonium-238 and convert it into electricity. The sub is designed to carry out a 90-day, 1,200-mile (2,000-kilometer) voyage through Titan’s largest northern polar methane/ethane sea, called Kraken Mare. Instruments aboard the sub would allow scientists to measure the trace organic components of the sea, which may exhibit prebiotic chemical evolution. A benthic sampler will collect and analyze sediment from the seabed. Examining the sediment, along with side-scan sonar readings of the seafloor’s morphology, may reveal evidence of historical cycles of filling and drying of Titan’s seas. The Cassini spacecraft has made multiple flybys of Titan since it arrived at Saturn in 2004, sending back imagery and data of Kraken Mare and the moon’s other vast northern polar hydrocarbon seas. Cassini’s radar has measured the depths of these bodies, some at only a few meters, while others, such as Kraken Mare, measured more than 660 feet (200 meters) deep, the maximum depth the Cassini radar can penetrate. However, creating a sub that can survive, travel, and successfully operate in the cold temperatures and strange conditions of a cryogenic sea was the challenge of the sub’s designers. Meeting those kinds of engineering challenges are the specialty of the COMPASS team at NASA Glenn. COMPASS stands for Collaborative Modeling for Parametric Assessment of Space Systems. It is a multidisciplinary team of engineers who use a face-to-face concurrent design process to develop spacecraft designs through integrated vehicle systems analyses. Specialists in propulsion, power, thermal environments, command and data handling, communications, guidance and navigation, all come together in an intensive developmental process. The COMPASS team is similar to the Jet Propulsion Laboratory’s (JPL) Team X and Goddard Space Flight Center’s (GSFC) Mission Design Lab. However, there is one significant difference. This back and forth, face-to-face, integrated analysis process, is essential to develop successful designs. Oleson insists it is all about having the right people. For the Titan sub design, as with other projects, Oleson was quick to bring in the perspectives and specialization of people from other centers. “I called Michael Paul at Penn State,” Oleson said. “He had worked on a Venus lander with us. And I knew they did torpedoes and all kinds of stuff there.” Paul is an engineer with Penn State’s Applied Research Lab. Paul made another important recommendation. “In my previous Titan work, I had worked closely with Ralph Lorenz,” Paul said, “and I was able to convince Ralph to join us as well.” Lorenz is a planetary scientist at Johns Hopkins University’s Applied Physics Laboratory (APL). “Ralph is one of the leading Titan scientists on the planet,” Paul added. Paul and Lorenz worked well with Oleson and the COMPASS team at NASA Glenn Research Center. The strange environment of Titan’s methane/ethane sea threw one of its biggest curves at the team as they tried to design a ballast system for the sub. This realization of the properties of nitrogen in Titan’s environment led to another discussion relating to its effect on the operation of the sub. Titan’s methane/ethane seas have been there for millions of years, which means significant amounts of the moon’s nitrogen atmosphere has been dissolved into that methane/ethane liquid. The Titan sub project completed its NIAC-funded first design last year. It was approved for further NIAC funding this past spring and is now moving into Phase-2 design work, allowing the COMPASS team to further explore solutions to the dissolved nitrogen issue, and develop the sub design in greater detail. In Phase 1, the team designed the sub as a stand-alone vehicle, not communicating with any other spacecraft or orbiter. Atop the sub, running the length of the vehicle, is an upright panel that appears to be a solar array. With the newly approved NIAC Phase-2 funding, the COMPASS team will now explore additional possibilities for the sub’s design and mission. The COMPASS team will continue to work these problems – a prospect Michael Paul looks forward to with excitement. The work that Oleson, Paul, Lorenz, and the COMPASS team are doing on the Titan Sub design may lead to an exciting mission of discovery on Titan in the 2040s. Their design work may also be paving the way for other subsurface explorations of alien seas and lakes in the future in other parts of the Solar System. This is SO COOL! It will be interesting to see the development of a Titan submersible versus a Europa or Enceladus submersible. Of course, a Titan submersible won’t have the issue of ice to deal with!